Factory Tour - Wuxi Huaye lron and Steel Co., Ltd. Adopted many new steel rolling technologies and automatic cooling line, the two hot rolled steel coil production lines are with annual output of 7000,000 tons, which can supply high quality hot rolled steel coil to meet customer’s demand. And with six accessory slitting machines, the product width can be multi-choice from 1010mm to 1800mm. 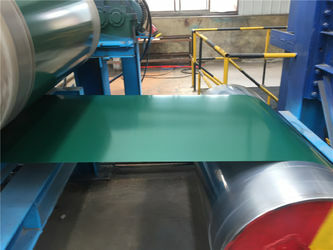 The whole equipment technologies are based on advanced techniques of steel cold rolling processing, fluid pressure sensing, electronic controlling etc. There are two pickling lines with annual production of 1.3 million tons, three cold rolling production lines with annual production of 1.6 million tons, two annealing lines with annual production of 0.5 million tons. The thickness range is from 0.15mm to 3.00mm. Specializing in the production of Hot-dip Galvanizing steel coils and related products. The annual capacity of this Continuous Hot-dip Galvanizing Lines which adopted the modified Sendzimir method can reach 700,000 tons. It can produce 0.14-5.0mm thick cold (0.15-2.5mm) or hot(1.5-5.0mm) rolled galvanized steel coils with 700-1550mm width. These lines are equipped with skin pass mill and can produce galvanized steel coils of regular spangle and minimized spangle with different specifications like CQ, SQ, FH and so on. The zinc coating is from 40g / m2 to 450g / m2. The lines can deal with various surface passivation treatment such as chromated, chromated with anti-finger or chrome free with anti-finger, chrome free, and trivalent chromium passivation, etc. Pre-painted steel coil equipments with high quality are mainly imported from U.S.A, Japan, and Taiwan. The designed capacity of the line is 150,000 tons per year. 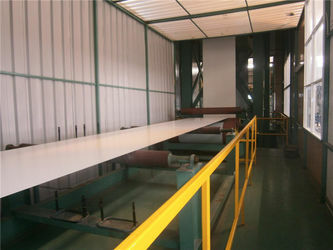 It takes advantage of American GFG coating system and the process of two coating and two baking. 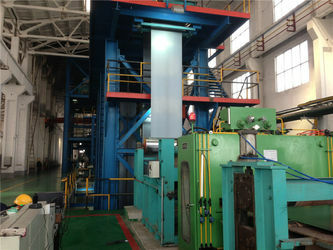 And one tension leveler was adopted in the exit side; therefore, high quality Pre-painted coils could be produced. Color coated products are widely applied to roof, outside wall, rolling door, sandwich plate, ceiling, daylight lamp manostat, antistatic and dustproof furniture plate, white board, and self-cleaning plate, etc. And we also have a professional processing center for slitting and flattening the thin gauge. Designed capacity is 600, 000 tons per year. There are six imported processing lines which are all high-precision slitting equipments. 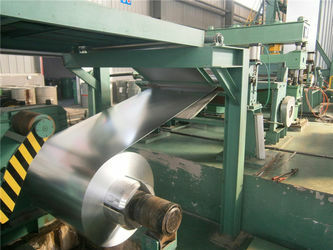 Highly advanced GI facility, specialized in producing Hot dipped galvanized steel strip 200,000MT annually. The continual hot roll steel strip in coil is made into galvanized steel strip in coil by means of passing through the molten zinc pot. Its uniformity, tightness, erosion resistance and pressure resistance characterize the coating on the product surface. In addition, the strength of the welding seam is satisfied. The thickness from 0.20mm to 3.0mm, and width from 30mm to 630mm. The Zinc coating is from 60g/m2 to 275g/m2. 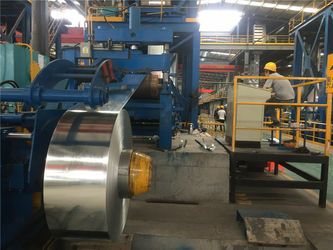 Specialized in producing Cold rolled steel strip 300,000MT annually, the major facility including 350, 450, 650,850 cold-rolled steel strip reversible and continuous rolling mills, 800HC rolling machine, 5 acid-washing production line, auto-control slitting machine vertically and horizontally, 10 sets of batch annealing facility, 2 continuously black annealing lines, ammonia decomposition, stove of arising coal gas. There are 6 welded pipe producing lines, specialized in producing steel welding pipe 100,000 MT annually, The sizes of the welded pipe: 1)RoundΦ12－Φ76, 2)Square15 X15－60 X60, 3)Rectangle10 X20－40 X80; Wall thickness: 0.7mm-3.0mm.